Fiat may have slipped into the driver’s seat. An autoworkers fund that owns 41.5 percent of Chrysler has been pushing for an initial public offering of the company as part of talks with its Italian partner. Chrysler’s board has now decided to delay the stock sale until next year, suggesting Fiat’s negotiating position has improved. The union probably needs Chrysler to be valued at $18 billion to make a listing worthwhile. Recent price talk has been somewhere around $9 billion to $12 billion, according to the Wall Street Journal. At the top of that range, the United Automobile Workers fund would end up with $5 billion. That falls short of the $6 billion maximum, including interest, to which it is entitled as part of a 2009 post-bankruptcy agreement. Fiat has already laid claim to almost a quarter of the trust’s holdings. Over the past year and a half, it has offered to buy from the union fund three separate 3.3 percent stakes. All in, these peg Chrysler at $6 billion, though no deal has yet been consummated. Remove that combined 10 percent holding, at $600 million, from the IPO equation and the UAW trust fund would need Chrysler to be worth $17.2 billion to make a public listing for its remaining stake worthwhile – or $18 billion, after factoring in dividends it would no longer earn. Pushing an equity offering into 2014 won’t obviously do much to improve the overall price new buyers would be willing to pay. Chrysler is predominantly a North America-focused company. That market has recovered well, with overall sales close to pre-crisis levels. Much of the industry’s growth will probably come from Asia and a recovering Europe instead, where Chrysler has little presence. Its pre-tax margin should improve from less than 5 percent to 8 percent by 2015, Chief Executive Sergio Marchionne reckons. That’s bound to be baked into assumptions already, though. In addition, by January Fiat will be able to make an offer on yet another 3.3 percent slug. Depending on how those deals are resolved, it would leave just 28 percent of the company available for the IPO, thus making it even harder for the trust to push for its desired valuation. A settlement with Fiat is increasingly looking like a better route. 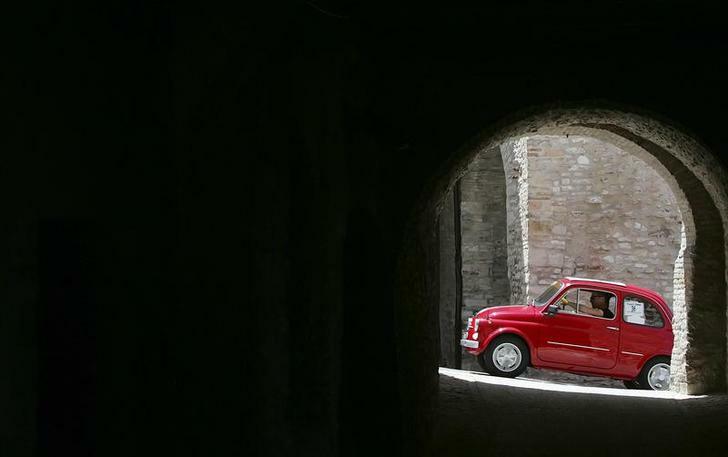 A member of the Italian Fiat 500 car club drives during a rally at the Fossato di Vico village in central Italy. The board of Chrysler Group has decided to postpone an initial public offering to the first quarter of next year, the company’s majority owner, Fiat, said on Nov. 25. Fiat owns 58.5 percent of Chrysler and its chief executive, Sergio Marchionne, also runs Chrysler. The rest of the company is owned by the United Automobile Workers’ healthcare trust. The trust and Fiat disagree over Chrysler’s valuation. The two sides are as much as $6 billion apart, although the negotiations relate to just a 3.3 percent stake of the overall company. Under the terms of the 2009 government-sponsored bailout of Chrysler, the trust is entitled to push for an IPO of some of its stake. Fiat wants to buy all the stock it does not currently hold.